VATICAN CITY (CNS) — Blessed John Paul II’s deep spirituality and his courage to uphold the truth were clear signs of his sainthood, said his successor, retired Pope Benedict XVI. “John Paul II never asked for applause, he never looked around, worried about how his decisions would be received. He acted according to his faith and his convictions, and he was also ready to take the blows,” the retired pope said in a book-length collection of interviews. Pope Benedict’s comments were part of the book, “Alongside John Paul II: Friends and Collaborators Tell Their Story,” a compilation of 22 interviews conducted by Polish journalist Wlodzimierz Redzioch. The recently released book was initially available only in Italian and Spanish. In a written response to the author’s questions, Pope Benedict explained his long relationship with the Polish pope, which began with their first meeting as cardinals during the conclave that elected Pope John Paul I in August 1978. “From the very start, I felt great reverence and a cordial fondness” for the then-archbishop of Krakow, who “outstandingly analyzed the nature of Marxism” for the cardinals in the pre-conclave meetings. Even though the two men were present during the Second Vatican Council and collaborated on “Gaudium et Spes,” the Pastoral Constitution on the Church in the Modern World, they had not personally met, he added. After Blessed John Paul was elected pope, he wanted then-Cardinal Joseph Ratzinger to leave his ministry as archbishop of Munich and Freising, Germany, to come to the Vatican in 1979 as prefect of the Congregation for Catholic Education. Pope Benedict declined, saying he wanted to fulfill his promise to lead the archdiocese, to which he had been appointed just two years prior. He said Blessed John Paul was very understanding and accommodated his request, but told him that, no matter what, he would eventually be called to Rome. In fact, he was named prefect of the Congregation for the Doctrine of the Faith in 1981. Blessed John Paul’s spirituality was marked by an “intensity of prayer” and was deeply rooted in the celebration of the Eucharist, Pope Benedict said. His prayerful devotion extended beyond just his own relationship with God and embraced a concern for the whole church and all of humanity, he said. “At the heart of his piety was anchored the task of bringing Christ to others,” Pope Benedict said, and his devotion to Mary was tied to her role as a model of how to be completely and willingly dedicated to Christ. As the two men worked together over the years, “it became ever clearer to me over time that John Paul II was a saint,” he said. Pope Benedict set aside the normal five-year waiting period after his predecessor’s death and allowed his cause to be opened early. 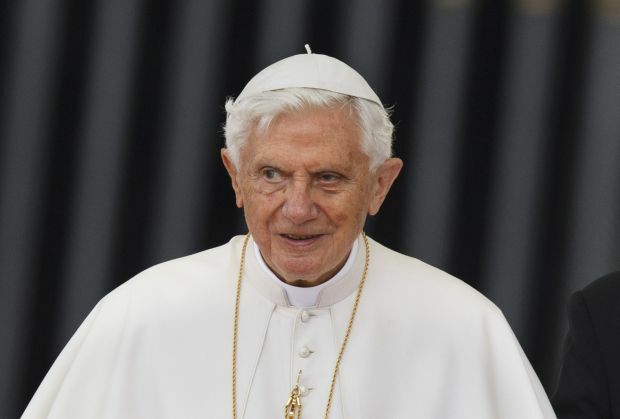 The late-pope’s joy throughout “the great pains” and exertion of his pontificate, his courage during “a truly difficult time,” as well as his intense relationship with God were all indications of holiness, Pope Benedict said. The retired pope said he will always be grateful for his predecessor. Pope Benedict also recalled the soon-to-be saint’s persistence and tireless commitment as he pushed himself physically on major trips and in his everyday routine at the Vatican.